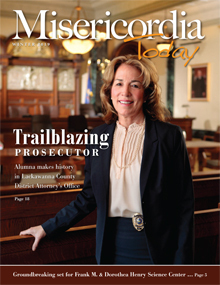 Click the Misericordia University Today cover above to view the full .pdf version. A digital view is available on Issuu. authorization of the Marketing and/or Public Relations and Publications departments. We will proactively seek information and prepare appropriate publicity materials for high-profile events, including commencement, convocation, concerts, new building dedications, etc. The University is a dynamic place that hosts hundreds of newsworthy events annually. Departments responsible for coordinating or planning such events should notify the Office of Public Relations and Publications at least two weeks prior to the event. Failure to do so could result in less effective publicity regarding your event or no publicity at all. Typically it takes five to seven weeks from initial notification to conduct an effective effort. Departments and colleges should also update the Marketing Department on the status of the project and include as much detail as possible. If you are ready to begin a project with the Public Relations and Publications staff, or need additional information please call 570-674-6372 or email pkrzywicki@misericordia.edu. The classic guidelines of “Who, What, When, Where, How and Why?" apply to any submission of material to Public Relations and Publications staff. For example: Who is speaking at the event? Who is coordinating the event? Who is the contact(s)? What is the topic? When and where will the event be held? For whom is it relevant? Why are we doing this? Please also submit any supporting information, photographs or images at the time of your publicity request. If thorough documentation and background material is not provided at the time of request, it may delay the processing of the publicity material. Of course, content may vary from event to event. Feel free to contact Paul Krzywicki, manager of Public Relations and Publications, at 570-674-6372 pkrzywicki@misericordia.edu or Marianne Puhalla, staff writer, at 570-674-6286 mpuhalla@misericordia.edu for advice on publicity as an event is being planned. It is important to note that although many Misericordia University events are generally considered newsworthy, each media outlet ultimately decides whether or not they will print our materials or cover an event or issue on campus. Public Relations and Publications staff have no control over the ultimate placement and use of University material in the “free" media. In addition to issuing media releases on noteworthy events, Public Relations and Publications staff also maintains regular, personal contact with the news media and individual reporters. Interesting stories are routinely “pitched" to reporters in the hope that they will find an issue or topic that is appealing to them. Individual staff and faculty are encouraged to provide detailed information about story ideas to Public Relations and Publications staff. Public Relations and Publications is the exclusive source for all official story ideas and coordination; however, this does not preclude individual staff members from maintaining relationships with the media. These can ultimately be helpful in getting stories placed. It is required that these conversations be immediately documented via email or memo to ensure careful coordination. Should there be any questions, please contact Paul Krzywicki to discuss the project in more detail. Misericordia University receives direct questions from members of the news media about a variety of issues. It is required that all contacts between members of the news media and University employees be reported to or coordinated by the Public Relations and Publications staff. This will help ensure consistency of message in all situations. Should you be contacted by a reporter by any means with a question that concerns University business or your role at the University, you should contact Public Relations and Publications office as soon as possible. Should there be any questions, please contact Paul Krzywicki or Marianne Puhalla to discuss interactions with the news media.